They don't hate them, they just aren't perfect. This group is like the BoV, they just take tested units that have been well worded and test them to make sure they are fair. If you want your units worked on and corrected, thats what the CHCG24 is for. I would, but not only was the last attempt close to a disaster and took far longer then needed due to the recent "news", but since I cannot nominate on my own units, I must rely on another member to pick mine, not to mention it has to be one of these. No, at the moment I do not think there is a group that can efficiently provide more than plain, old feedback. I would love to perfect these units, do not get me wrong, I just need people to give me feedback, of which I just got plenty, though most of it was the (as my psych teacher calls it) "bad" feedback, lacking possible suggestions or advice. However, I did receive plenty of "good" feedback, of which I am currently working off of. I think all the information required for nomination is there. Let me know if there is something I overlooked and forgot to include. After some discussion we've decided to implement a limit of one nomination per post, so choose wisely. Edit: You put you're H3X symbol where we are planning on putting our SoV symbol, so I vote NO to review. Not really. Awesome minis. Let me ponder a little, and I'll get back with a real vote. Edit edit: As I was pondering I became worried about how an all-melee army would handle facing these guys, and started to think that 60 points was way too cheap, until I realized that it wouldn't be too difficult to start off a chain reaction where a Zombikaze army obliterates itself. I don't think I can fairly judge them without playing them, so I vote YES to review (plus they look cool, and have a d20 power-two of my HS weaknesses :kryptonite . Last edited by Killometer; November 16th, 2010 at 08:12 PM. Hi Krysto...tcg is right this is the BoV of customs. We are not going to polish before proceeding, but what I'm going to try to di is make further comments and suggestions in the author's thread. I did that for Therian and was planning to that tonight for you as well...but you submitted 5 entries at one time and I have a lot of notes to go through, before I post in your thread. I made this commitment with every intention to be more involved in the Custom community and I hope I will be able to help you and others in the future. These guys are way too cool to not give a try. Yes to review. Oh my god that is awesome. How could I not vote to reviewing Zombikazes? On a serious note, readers of this thread may wish to take a moment and look at how well hextr1p described two complex abilities. There are a couple of things that make these powers easy to understand. The language is clear and simple. You may also note there is relatively little punctuation, and frequent use of terms and phrases we know from other cards. This is an excellent example of a card with complex but *well written* abilities. You guys are 100% correct. I'm pulling all of my customs back and starting a freelance feedback thread for that exact purpose. So to anyone who wants to polish up their units, check it out, the 3FG is ready to go! You'd think Hex had some experience working on cards or something. hextr1p's Zombikazes have received more than the required 4 YES votes needed to move on to being reviewed. Congrats! Good for you, Krysto, I think a quality workshopping thread would work very well with this project and I look forward to seeing what you guys do. Good luck, godspeed, don't be a stranger, etc. 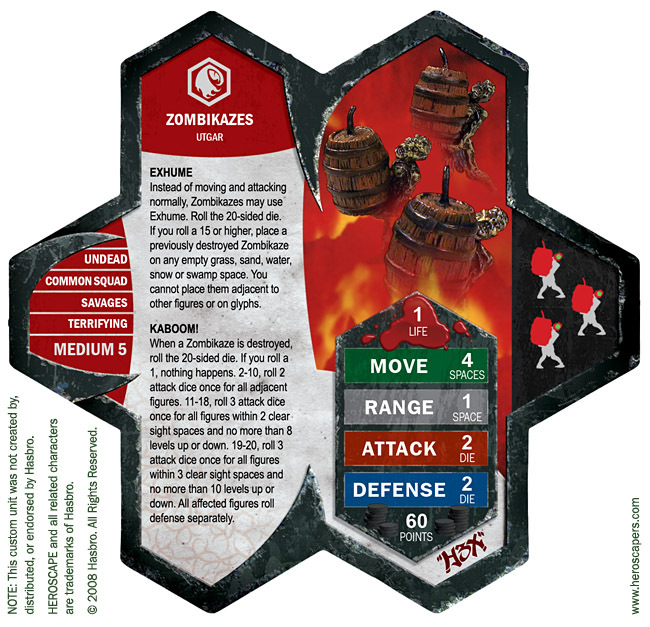 Well, I missed getting to accept hextr1p's Zombikazes for review but I will definitely not miss out on getting to playtest them!